This is the second of two articles which looks at joint property ownership of rental properties (excluding furnished holiday lets). 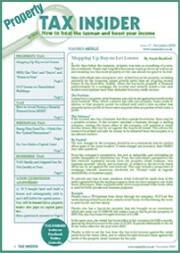 See Property Tax Insider (March 2011) for the first instalment. This article concentrates on non-spouse (or civil partner) joint ownership. The term ’joint ownership‘ refers to ’beneficial‘ not ’legal‘ joint ownership; tax consequences follow beneficial ownership. The renting out of property produces rental income which is subject to income tax on the part of the beneficial owner of the property (less relevant tax deductible expenses e.g. management fees; repairs; maintenance etc.). The highest rate of income tax for the tax years 2010/11 and 2011/12 is 50%. Unlike the position with respect to spouse jointly owned property there is no automatic 50/50 split of rental income for income tax purposes. The split of rental income depends upon the agreement between the parties and does not need to be in line with underlying ownership percentages of the property. Thus, for example, if one person owns 80% and the other person owns 20% of the property, any rental income may be split as agreed. This may be 80/20; 70/30; 90/10 or whatever else is agreed. If each person is liable to income tax at the same marginal rate whatever the agreed split, the same aggregate income tax charge will arise. However if, for example, one person is liable at the 50% marginal rate of income tax and the other person has no taxable income, it may make sense to ensure that the person subject to the lower rate receives a greater proportion of the rental income. For spouse jointly owned property any split of rental income other than 50/50 must be in line with the underlying ownership percentages and a Form 17 must be filed with HMRC. However, for non-spouse joint ownership, Form 17 is irrelevant; all that is required is that the parties agree the relevant rental income split, preferably in writing. Where one spouse owns 100% of the property but is exposed to a marginal rate of income tax at 50% whereas the other spouse has no taxable income, if just 1% of the property is transferred to the other spouse, rental income is automatically split 50/50 thus producing an income tax saving. However, this would not be the case for non-spouse joint ownership as the automatic 50/50 split does not apply to non-spouses. It is also necessary for the parties to agree how expenses will be borne, which again, can be whatever the parties agree. Transfers of ownership (in whole or in part) of property between spouses precipitate no CGT charge and no stamp duty land tax (SDLT) charge (assuming no mortgage). However, transfers between non-spouses precipitate a CGT charge as the transfer is assumed to be at market value but any SDLT charge is based upon any actual consideration passing (which may or may not be market value). For non-spouse joint ownership, it is probably preferable to own the property as tenants-in-common. This allows the respective ownership interests to be left by will; ownership as joint tenants means that one person’s interest automatically passes to the other surviving joint owner and thus cannot be left by will which may not be what is typically wanted in non-spouse scenarios (unless if (for example) a couple co-habit as if husband and wife). Ensure ownership as tenants-in–common as greater flexibility, both for tax and non-tax reasons, arises.